Ali, now a postdoctoral associate at Utah State University, was lead author of a paper, titled “Resource Selection and Landscape Change Reveal Mechanism Suppressing Population Recovery for the World’s Most Endangered Antelope” that appeared in the Feb. 15 (today) issue of the Journal of Applied Ecology. The publication is a bimonthly journal of the British Ecological Society that publishes high-impact papers on the interface between ecological science and the management of biological resources. The article first appeared in the journal’s online edition Feb. 3. 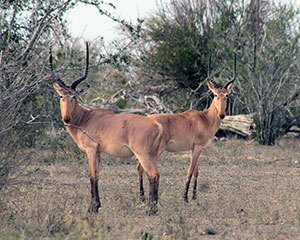 Between 2012-15, the researchers used GPS collars to track more than 50 hirola from seven herds, and found that the antelope prefer grassland habitats. Using a time series of satellite imagery, the authors showed a 250 percent increase in tree cover since the mid-1980s in the hirola’s native range. This "tree encroachment" occurred at the expense of grassland habitats. These challenges haven’t stopped Ali, who is forging ahead with hirola projection and community engagement. In the second year of his Ph.D., Ali founded the Hirola Conservation Programme and is currently its director. Through this organization, Ali and his team are active in restoring grasslands throughout eastern Kenya through elephant conservation, clearing of trees and grass reseeding -- solutions that will provide benefits to both people and wildlife.